This year’s new Art Basel addition was housed in the rundown Ocean Terrace beachfront hotel without AC and featured young artist-run spaces. Despite the limp and steamy heat, participants in this fair boasted so much energy, so much pride in themselves and this collective effort, that I walked away with a buoyant hope for the future of the arts. Like every ‘next generation,’ the Artist-Run fair featured lots of idealistic, un-commercial projects and their focus on ideas, no matter how ridiculous or purposely slapdash, was refreshing. Full disclosure: this fair included a number of friends, colleagues from Baltimore, and former students from MICA, so I am definitely biased about it and I thoroughly enjoyed my visit. However, I also have a lot of questions. My main concern is about the future: Will this type of anti-fair continue to exist as these artists and galleries grow older and accumulate mortgages and art school loan payments and babies or will this group reluctantly graduate into larger, more commercial fares where their ideas become more compromised and idealism more resigned? Or, is a collective artist-run approach a new and viable direction for the future? Each booth at Artist-Run cost something, but was affordable for young artists and galleries. In addition, there was a tacit understanding that these booths would not be selling art (or selling it very quietly), to pose no competition to the parent fair, Art Market Productions & Select Fair. Does that make any sense at all? An art fair that isn’t supposed to sell art? If that is really the case, then the purpose of this fair was purely social and experimental, which is fantastic for visitors, but isn’t a fair supposed to provide an economic boost for a gallery? I am sure the contacts, friendships, and relationships formed here, especially between exhibiting entities, will help to propel careers forward for decades, and this opportunity for collaboration is incredibly valuable. However, I have to question whether this is a sustainable economic model or a one-time deal. Also, is it fair for the parent fair to to treat young artists and galleries this way? Or, conversely, are the other, more commercial fairs just presenting a false version of success where sales loom large and the art is trendy and thin? I have received no less than three PR emails from Art Basel since returning to Baltimore boasting giant individual sales and sales records, and it feels obnoxious and desperate. I don’t care if a Francis Bacon sold there for 15 million dollars. Why is this news?? The Artist-Run model makes me feel better about being an artist, but I am curious: Which model serves artists better? Or can we just embrace a pluralistic approach to art fairs where everything is good? On the whole, Artist-Run exuded an invigorating ‘I don’t care’ attitude, where some doors were closed when we arrived and others open, a place where authentic visions, like the sand sculpture presented by Arzabe & Reichert from SF and the Stupid Bar presented by Baltimore’s Open Space, could function in immersive, smart, and funny ways. Our bartender at The Stupid Bar. Artist-Run clearly communicated that it was a place where artists get to be artists, presenting ambitious works in line with the best recent art school graduates, featuring 40 ‘installation/ environments’ from 18 different American cities and two from Europe. From what I could tell, each grouping featured works by mostly white artists with ties to urban centers. Although many exhibits claimed to explore different types of fringe subcultures, I would like to suggest more age and racial diversity in reflecting the future of the arts and artist-run spaces if this fair continues into the future. 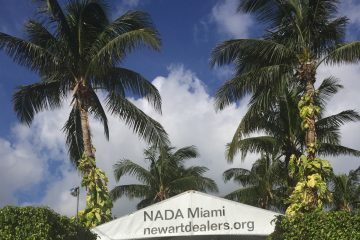 Regardless, Artist-Run’s presence at Art Basel Miami Beach at a time when hundreds of thousands of art lovers and collectors descend upon the city is a welcome reminder that young artists will always find a way to exhibit the work they care about, regardless of money or sales or faux VIP status. According to their press release, “Each room will be a unique reflection of how that participant has chosen to bring artists together and execute their project.” Bringing artists together, especially from across the country, is always a worthy goal and generates exponentially more energy outwards than it required. In short, this fair was a joyful experience and the participants seemed to be thrilled with the response and energy they have received. Press reports from fair participant Art F City document two artists actually getting married at the Artist-Run fair, not as a publicity stunt but as a ‘one night stand gone bad,’ furthering the image of this fair as a giant love fest for artists. I still balk at the predatory relationship between a larger, well funded parent ‘developer’ and young artists, and would like to suggest that developers and established art fairs should have paid these artists to bring their ideas and energies to the area, rather than the other way around. According to the press release, the sponsoring developers will be shortly tearing down the Ocean Terrace, in creating “a catalyst for the rebirth of Ocean Terrace and upper Collins Avenue and further the area’s revitalization,” and this makes me wonder who this experience serves and why. The statement continues, describing the rosy future for the area: “The neighborhood will once again be a thriving, vibrant center for North Beach residents, and a high quality destination for visitors from all over the world to celebrate life, community, and to enjoy beautiful historic hotels, shops, open spaces, art and architecture.” Does this suggest, inadvertently, that the Artist-Run fair was not a high quality celebration of life and community? History teaches us that this ‘thriving’ future will not include young artists, but there will always be opportunities to move up the beach. * Follow Up 12/9/2015: Art F City Editor Paddy Johnson just informed me that the Ocean will not be torn down after all to make a giant condo hotel. Miami voters decided not to approve zoning for a giant new condo complex and are favoring a preservationist agenda instead b/c the hotel is historic. Details here from the November 3 Miami Herald. Check out photos below from Artist-Run below featuring a number of our installation/ environments! This skirt was the perfect art prop! Check out the amazing bathroom installation below! Bathroom Installation by Lee Heinemann for Platform Gallery, Baltimore The Stupid Bar by Open Space from Baltimore was like being in a David Lynch movie. I loved being served a bracing vodka tonic poured from a plastic bottle of Anti-Freeze into a Hello Kitty mug by a bartender bleeding from the mouth. I did. Open Space’s Stupid Bar featured ‘Not Not Art’ and immersive performance! The details in this bar were impressive without appearing to be so. Even a baby visitor had to wear a Stupid Bar wrist band, cut small for a tiny baby ankle. The bar across the hall was an installation by Art F City. They were nice but didn’t offer us any drinks. But that was probably because we were still nursing the plastic mugs from the Stupid Bar. We were bummed to miss Michael and Paddy there. Art F City’s bathroom installation. The wall text sticker on the toilet was classy. More Art F City bathroom art. Wickerham & Lomax in the Art F City Dyke Bar! Yay! The COOP Curatorial Collective featured four married couples from Nashville making art together all crammed into one hotel room, like a mass honeymoon on art. The couples were Alex Blau & Paul Collins, Virginia Griswold & Morgan Higby-Flowers, Ariel Lavery & Chris Lavery, and Clarissa Rose Peppers & Nicholas Hay. Below, is Terrault Contemporary (another Baltimore gallery) featuring video and installation by Helen Jackson-Adams. Gravity Assist was a large group show from Sediment from Richmond, VA. It featured a lot of sand with the art. This is me texting the Uber, who I am guessing made more $$ than all the art fairs combined. Arzabe and Reichert from San Francisco created a sand installation based on the history of the area, when it was a refuge for, well, refugees. Below is a sand model of the first house of refuge built in the area. He was about to lead a tour out to the area where it used to be, on some of the last undeveloped (preserved) land in the area. The view from the window looking out at the beach and then, down below, where an artist talk was about to happen.